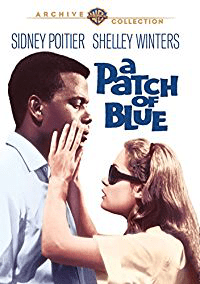 In A Patch of Blue (1965), Gordon (Sidney Poitier), a black man, and Selina (Elizabeth Hartman), a blind, white teenager, fall in love in the racially charged 1960s. Released in 1965, A Patch of Blue was met with a mixed cultural reaction. While nominated for a number of Academy awards for acting an production, the film had to be edited (kissing scenes between the main characters removed) in order to play in the American south. Based on the book Be Ready With Bells and Drums by Elizabeth Kata, the themes of human kindness trumping all else and love is blind is a vibrant thread in the film that catapulted Poitier into the public consciousness. Selina, at the start of the film, is something of a Cinderella character. Her mother, played by Shelley Winters who won an Academy Award for the role, is a prostitute who is abusive to Selina. Her grandfather, Ole Pa (played by acclaimed character actor Wallace Ford in his final role) is an alcoholic with something of a soft spot for his granddaughter. When he takes her to the park, she meets Gordon. Gordon is kind to Selina and they swiftly become friends with Selina entrusting him with terrible secrets and childhood tragedy and abuse at the hands of her mother’s many “boyfriends.” As the movie progresses the risks to Selina and the urgency to extricate her from her situation grow and though Gordon cares about her, he sees the impossibility of their lasting relationship. Sidney Poitier plays the empathetic and kind hero to perfection. Like his character in To Sir, With Love, there’s a solid sexiness in his efforts to save Selina from both obvious and not so apparent threats. He is unapologetic in the quest for what’s right. The dichotomy of the confident and successful Gordon with the isolated and abused Selina is poignant and transcends race. Gordon opens Selina up to the possibility of a life she’s never known of gentle words and kind acts. The low budget simplicity of the scenes is beneficial to the stark nature of the piece. I’m a person who watches old films and searches Wikipedia for information about the actors. It’s usually quite fun to find out what happened to them and the quirky little tidbits otherwise unknown. I was devastated to discover that Elizabeth Hartman committed suicide at the age of 43. She was plagued by depression and ended her life by jumping from her fifth-floor apartment window. After watching Hartman in the role of Selina and her brilliance in playing the oppressed teen learning to open to the world, I wanted her to have had a happy life. If you’re looking for a really wonderfully acted movie, check out A Patch of Blue. It has a 100% rating on Rotten Tomatoes and is deservedly highly acclaimed by audiences today.